Here's a superb new online slots game from NextGen Gaming that you can have fun playing. 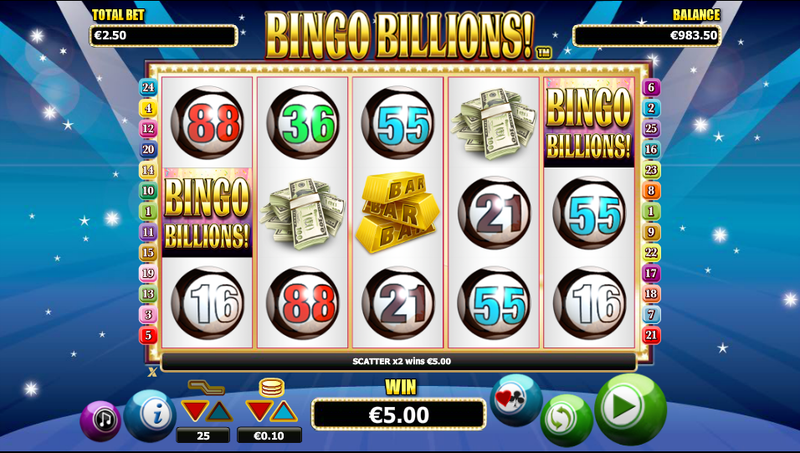 Eyes down for a full house, with Bingo Billions online slot game! Who doesn’t love a good game of bingo? If you enjoy a flutter, there are many different ways to try your luck, and this game combines two of those in one spectacular package. Many slots fans also find a thrill in shouting for a line or a full house, so much so, that bingo halls usually have arcades on-site for their players to enjoy. Those who prefer to place their bets from the comfort of their own home, though, are sure to love this game. So, find your seat, grab your dabbers, and get ready for a bingo-riffic experience! Check out our entire list of uk slot games at SlotsBaby. NextGen have been around since the late 90s, and they sure know their stuff when it comes to online slots. They’re at the cutting-edge of slots content delivery across different platforms, too, and many of their games can be played on mobile as well as online. Their unique brand of compelling, bonus-rich gameplay is fashioned to appeal to both online slots beginners and more seasoned players. 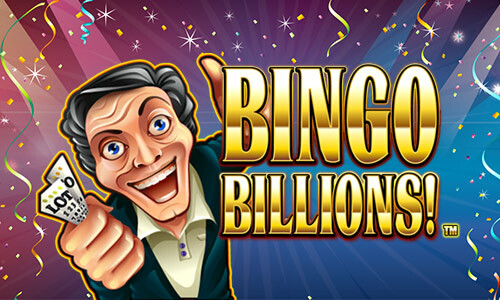 From the opening screen of Bingo Billions, you get ‘that winning feeling’, and this continues as you enter the game screen and start spinning the reels. The background is a spot-lit stage, and the 5 reels are the star. Twinkling stars in the background provide a dash of pizzazz, and the game’s title in shining gold lettering above the reels is glitzy and glorious. WILDS – an ecstatic guy giving the thumbs up and clutching what looks like a winning ticket represents a WILD, and he stands in for any symbol except SCATTERS. 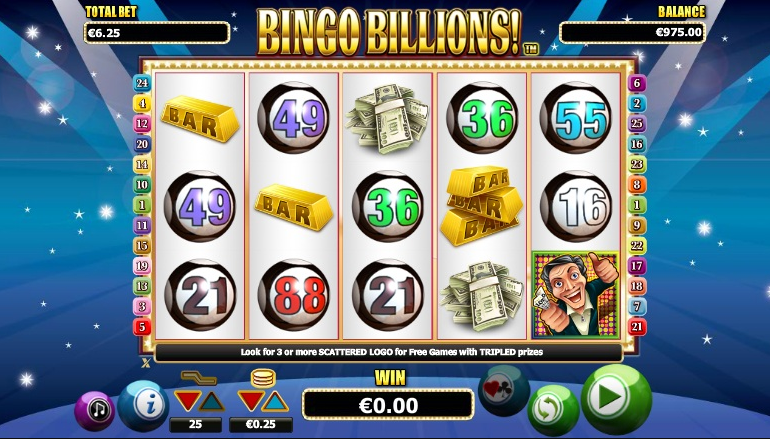 SCATTERS – if 3, 4 or 5 purple and golden SCATTER symbols appear, this will trigger 10, 15 or 20 Free Spins. What’s more, all prizes are tripled throughout these Free Spins. GAMBLE – NextGen know how to deliver a good Gamble feature, and its inclusion makes their games really deliver for those who want to play for higher stakes. To gamble any win (apart from a Progressive Jackpot win), you can select a colour or suit of card, doubling your win for a correct colour, and quadrupling it for a correct suit. We just had to Knock on the Door (24) to tell you that Man Alive (5), this is a game worth shouting about. Its wealth of features and snazzy design make it just our cup of tea (3). We don’t want to Bang on the Drum (71) too much, but we really think that Bingo Billions online slot is Top of the Shop (90)!